See a more-detailed rundown on the contest rules and regulations by clicking here. Due to space limitations, we are limiting the maximum diorama size to six square feet. This could be a 2x3 foot model, a 1-1/2x4 foot model, or any size combination that adds up to six square feet at maximum. This class covers a set of equipment which typically operates together. The most obvious is a train, such as a log train, work train, and so on. If you enter a train, due to space restraints, it must have a maximum of eight pieces – this could be a loco, caboose and six cars; a loco and seven cars; a string of eight cars; you can do the math on this one. It could also be a steam donkey on a moving flat, perhaps accompanied by other cars full of related hardware. The equipment does not need to be railroad hardware. For example, the equipment that makes up a sawmill’s interior, including the head rig, edger, cutoff saw, planers and so on are also an Equipment Set. There’s lots of room for imagination here. The Camp Cars contest class helps clarify our contest entry process. This class is for mobile camp cars such as bunk, commissary, kitchen or dining halls, a saw filers’ shed, and so on. The structure must be of the type designed for transport on its own trucks, and for the contest, it must be displayed on trucks. Model Logging Supply is sponsoring a new contest award. 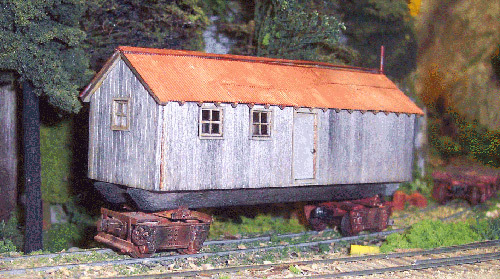 The company is manufacturing new HO kits that represent four different versions of the Consolidated Timber's skid shacks. These kits can be seen and ordered at the company website at www.govair.com/mls.htm. If you build one or more of these kits and enter it in the regular contest you will be eligible for a special award from MLS. Note that this award is separate from the regular Congress model awards, so you could win the MLS award AND a Congress award with the same model. What are we looking for? The most interesting and well-built use of one or more MLS Consolidated Lumber Co. kits. Judging will be done by a three person panel. If you have any questions just email Lon Wall at his Contact Us address. We have a cool contest category called “Mini Diorama,” and the rules are simple. The diorama must be sized no larger than 12 inches square, although it can be as tall or as deep as you want. The Mini Diorama class means those who build small models won’t need to compete with the big engine houses, machine shops and lumber mills that are so large and impressive. The only other requirement is that the content reflects a logging theme. 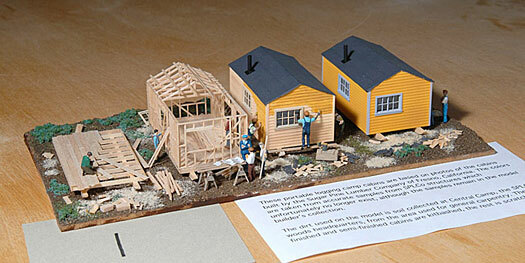 As an example, the photo shows a mini diorama, built by Jeff Johnston, of the carpentry area at Central Camp on the Sugar Pine Lumber Company. This unit measures about 5 x 10 inches and packs a lot of interest into a small space. Other Mini Dioramas we’ve seen have included simple freight or passenger stations, a cross-section chunk of an engine house with cutaway walls, a highly detailed segment of a trestle and so on. It’s surprising how creative a modeler can be with such a small space. Commercially-built models are not permitted in the contest, but they can be presented for display only as space allows. “Commercially-built” does not mean a model built or kitbashed from kit, it means a model built for hire (or built for free as a charitable contribution) for display in a museum, a customer’s personal collection and so on. Bring your Mini Diorama out to Camp 18 and show us what you can do. We encourage all models whatever the scale (up to ½ full size) and whatever the experience level. Our only requirement is that models have a direct connection to the wood products industry, past or present. This includes logging, sawmilling, the pulp and paper industry and includes lumber retailing as well. The Contest Coordinator may disallow any extremely large entry if there is inadequate space available. The individual designated as Contest Coordinator has the final say as to class placement of your model. All judging is by popular vote. Plaques will be awarded for First place and Second place, with an award certificate for Third place. We encourage you to put a small card with your model that explains what you’ve done and significant points such as “totally scratch-built” and so on. Include whatever information you believe helps explain why this model is special. But please, DO NOT list your name! A model that has taken a First Place or Best of Show award cannot be re-entered (in competition at least) in subsequent years, regardless of changes made to it. However, we strongly urge you to bring it as a display if you’d like. If your display-only model (logging subjects only) is very large, please call us ahead of time, as space for the contest models is tight and we may not have room for extra large or long display-only models. We’ll accommodate you as best we can, but ask first and we’ll avoid any unhappy situations the day of the event. The disclaimer: All entrants are required to sign a release form that covers liability on any and all models they may display or enter. While we make a reasonable effort to protect your models neither the sponsors of this event or Camp 18 can be responsible for vandalism, damage, theft or any other kind of loss. There is no pre-registration. Doors open at 9 am, and we wrap up around 6 pm!